Most parents like to decorate the walls of the venue with balloons and party banners, and the food tables with decorative disposable tablecloths. You may also like to provide party bags for the children to take home afterwards. Mr Phil will provide balloons for the children to play with, the party music and all other equipment needed for the entertainment. (for anywhere in South Devon). This is the total price you pay, including Mr Phil’s travel and expenses in all areas of South Devon, including Plymouth, Exeter and Torbay, Newton Abbot, Teignmouth, Exmouth, Okehampton, Tiverton, Honiton, Kingsbridge, Tavistock and all areas inbetween. Can you do one hour instead of two, and how much is it? Mr Phil can do a one hour party if you wish. The fee for a one hour party in South Devon is £150. Will you travel outside South Devon? Mr Phil mainly entertains at birthday parties in the South Devon area, but he is also happy to travel further afield. If you are in a different area please feel free to get in touch for an accurate quote. If you are just outside the South Devon area there may be a travel fee of £10-£20. How do I pay and do you require a deposit? Mr Phil prefers not to charge a deposit. He feels it is much easier for everyone just to have payment on the day. When all the details of the birthday party have been agreed he will send a booking confirmation by email (or post if you prefer) to confirm everything in writing. To cover for cancelled bookings he has a standard cancellation policy as below. He hopes you find this fair and understand. “By confirming this contract you are agreeing to its’ contents and agree to pay the fee. Non confirmation of the contract is not sufficient to cancel the agreement. Please contact me within 48 hours of receiving this email if you do not agree to the contents. Should the booking be cancelled within 14 days of the engagement date the full fee, less estimated travelling costs, will be payable. Should the booking be cancelled more than 14 days prior to the engagement date, 50% of the full fee is payable. Do I need to book a hall or can I have the party at home? Mr Phil generally recommends booking a hall. There are a lot of halls available locally at a very reasonable price. It’s much easier with more room for the children to run around, and you don’t have to worry about them damaging the living room! Usually people book the closest church hall to them. It is however possible to do the party in a house if you prefer. Please ensure that there is plenty of room indoors for the party and for the children to dance about with games like musical bumps. You may wish to limit the numbers of children if space is limited. Mr Phil recommends that you clear the room of any toys or distractions, and that any valuables that could be knocked over are safely put away. Can I have the party outside? Mr Phil doesn’t do birthday parties outdoors or in gardens. He wants your child to have the best party possible. He feels the British weather is far too unreliable and even if it is nice weather there are always lots more distractions outside that can affect their enjoyment of the party. No-one enjoys a show with hot sun on them, or a bee buzzing around. Should I book the hall or entertainer first? It’s recommended that you book the children’s entertainer first before the hall. Mr Phil gets booked up far in advance. 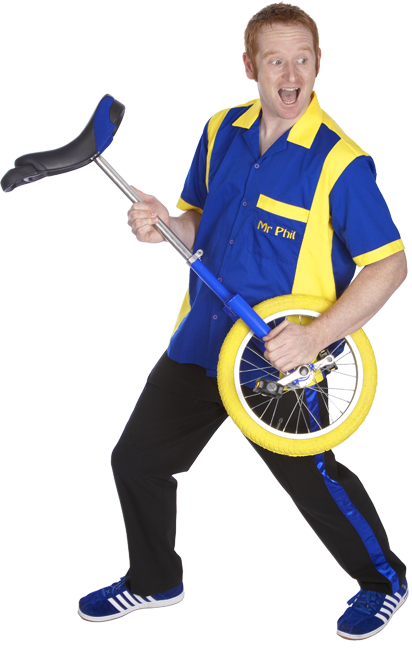 There are lots of halls you can use, but just a few good children’s entertainers and only one Mr Phil! There is however no extra charge for more children and if you wish to invite more feel free. Please let Mr Phil know if there are likely to be more than 35 children attending so he can bring extra equipment if necessary. Can you do joint birthday parties? Yes, Mr Phil is happy to do joint parties with more than one birthday child. There is no extra charge for this. For the children to enjoy the party as much as possible it is recommended that they are all of a roughly similar age. Do you have Disco music? Yes, Mr Phil always brings a PA speaker and lots of the children’s current favourite music. Can you do other events such as fetes, weddings or Christenings? Yes, Mr Phil can entertain the children at other events. Please get in touch to discuss your requirements.